“The Woodglen Drive Bikeway Improvements Project once completed will be an example of a complete street designed for users of all ages, modes and mobilities.” — from MCDOT’s newsletter, and music to our ears. The Montgomery County Department of Transportation has released its latest plan affecting White Flint: the bikeway improvements coming to Woodglen Drive. An 8-foot, off-road, asphalt, shared-use path will connect the entrance of the Bethesda Trolley Trail with Nicholson Drive, along the western edge of Woodglen. Bikers will share this route with pedestrians. “Safety features, including the construction of curb extenders, at the intersection of Executive Boulevard and Woodglen Drive, will be incorporated into the roadway design to discourage speeding and alert motorists to the pedestrian/cycle-friendly environment of Woodglen Drive,” says MCDOT’s newsletter, released today. Read the full newsletter, and see images, by clicking here. In addition to the off-road shared-use path, bike lanes will also be installed on the road itself. In the northbound direction, travelers will find a new 6-foot wide bike lane. Installation of this will require the removal of six metered parking spaces on the east side of Woodglen. In the southbound direction, bikes and cars will share the road, as indicated by the addition of “sharrows,” the shared lane pavement marking symbol (see below). Construction of the full project is slated for this fall. While this is only a three block-long improvement, it’s a start toward making our roads more friendly to all users. 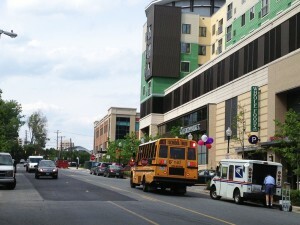 After all, as MCDOT acknowledges in their announcement, “in Maryland, bicycles are classified as vehicles and are permitted on any road where the speed limit is posted 50 mph or lower.” Ultimately, as redevelopment occurs on the blocks north of Nicholson Drive, the shared-use path will continue, connecting to the White Flint metro station and beyond. The Trolley Trail is a fantastic resource, connecting White Flint with Bethesda while avoiding roads and traffic. It’s great for commuters, recreational bicyclists and walkers alike – as long as you’re traveling in daylight. At the moment, the Trolley Trail isn’t lit. These improvements and the lighting of the Trolley Trail will likely be on the agenda at Friends of White Flint’s next meeting in just a few weeks. Learn more by clicking here and let us know if you can come. See MCDOT’s flyer in full by clicking here. This entry was posted in Development Projects, New Urbanism and tagged bike lanes, shared-use paths, Trolley Trail. Bookmark the permalink.